The Eastern Federal Lands Highway Division (EFL) within Federal Lands Highway (FLH) has provided training on sustainability and livability for a number of years. Recently, EFL decided to embed concepts from INVEST’s Project Development (PD) module into their Construction Winter Training Program. The aim of this training is to increase awareness and facilitate greater discussion about sustainability and to further integrate sustainability considerations into project planning, design, and construction. 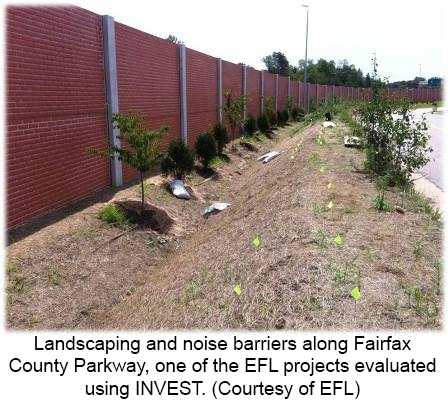 Located in Fairfax County, Virginia, these projects involve creating two new four-lane divided roadways to provide vital east-west links between Richmond Highway (U.S. Route 1) and Telegraph Road (VA Route 611). Mulligan Road will serve as a replacement to Beulah Street (VA Route 613) and Woodlawn Road (VA Route 618) within Fort Belvoir, which were closed to public access by the U.S. Department of Defense following the events of September 11, 2001. In addition to constructing a roadway and median on a new alignment, these projects also include building multiple bridges and large culverts to make the roadway corridor more transparent, promote wildlife passage, remove existing roads through wildlife corridors, and develop a shared-use path for pedestrians and bicyclists. The Fairfax County Parkway project also includes construction of a commuter parking and transit interface within an interchange. In 2011, as part of work related to the creation of FLH’s Best Management Practices for Sustainable Road Design and Construction, the Mulligan Road project was evaluated using the Pilot Test Version of INVEST. The aim of this report was to provide case studies of seven FLH projects in order to identify sustainability best practices, suggest improvements to FLH projects, and test different sustainability ratings systems. Using INVEST, the Mulligan Road project exceled in the criteria related to context sensitivity, pedestrian and bicycle access, ecological connectivity, long-life pavement, environmental training, and construction quality control. Other criteria identified as potential areas for improvement, with relatively low additional effort, included site vegetation, reducing and reusing materials, and construction waste management. These suggestions along with recommendations from the other case studies have helped inform EFL’s current and future projects. Moving forward, EFL plans to continue using INVEST to guide their trainings for sustainability and livability and to evaluate projects, including reviewing five projects in 2014. By highlighting sustainability and INVEST through their Winter Training Program, EFL has exposed staff to the benefits of integrating sustainable practices into roadway projects and has encouraged project managers to seek out opportunities for sustainability early in the project development process. INVEST has become a tool for implementation of EFL and partner agency values at the project level. EFL has identified ways to improve INVEST so the tool can more appropriately capture Federal Land Management Agency work.